A visitor's and a performer's shadow meet on a white canvas. ENCOUNTERS is an intimate interactive installation in which the canvas reveals what happens when two people meet for the first time. How do you react? And what is the other person's reaction? The visitor follows a path that takes him in front of a canvas with his own shadow cast on it. From the other side of the canvas, another shadow appears; the one from the performer. Over 4 minutes, both shadows interact under a song and projections. The installation works so that every 5 minutes a new visitor enters the space, when the projections restart. 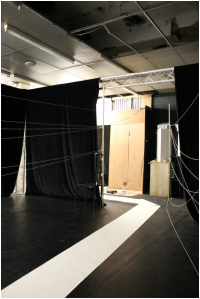 ENCOUNTERS was developed and originally presented within the program Garfan Yr Odyn at Volcano Theatre (Swansea) in May 2014. 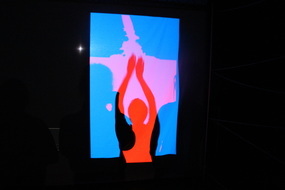 The video projections (one in red, one in blue) were projected from each side of the white canvas. The moving images, synchronized with music by Nico Muhly, were the setting for a unique and live experience between a visitor and a performer (me). “Really loved it. A very happy experience. It´s good to force me to get involved. Glad I came down”. “So magical and wheightered. The fragility of an encounter with another person". An R&D version was presented during the London Festival of Architecture 2015 – Open Studios. 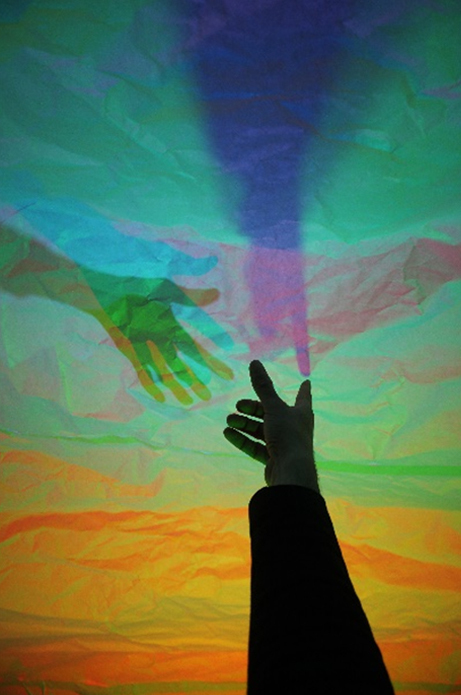 Instead of projecting videos, in this case primary colours were used (Red, Green and Blue); mixed, these lights created the rainbow spectrum in which shadows would meet.